My favorite Batmobile is the one that appeared in the mid-40s, with the giant Bat-face on the grill and a huge, sweeping Bat-fin poking out the back. From a practical perspective, however, I am forced to admit that the machine he's driving in the new Batman: Arkham Knight trailer has the edge. Maybe I'm imagining things, but I have this oddly persistent recollection that Batman, in his early days, swore that he would never use a gun. Yes, I know that he's used guns many times over the years, and he's killed several people with his bare hands, too. Even so, a Batmobile armed with a minigun, a 20mm Oerlikon cannon, and a multiple independently-targeted rocket launcher strike me as a bit non-Batman-ish. Then again, I also think that it's not a proper Batman fight unless it's interspersed with brightly-colored "BAM" and "POW" placards, and I have to admit that this does look like a lot of fun. Time behind the wheel of a vehicle that drives like a Ferrari and hits like an Abrams is time well spent no matter how you look at it. This is, you will no doubt notice, part two of the Ace Chemicals "Infiltration" set; catch part one here. Sam also played the game way back at E3 this year. 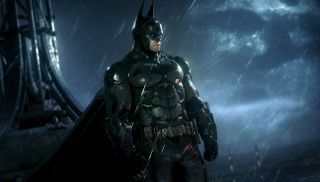 Batman: Arkham Knight comes out on June 2, 2015.